Explore the shining Jewel of faerun Waterdeep beckons! For centuries, this grand city has stood at the edge of the Sea of Swords, tempting heroes with its bustling port, thriving markets, hidden perils, and half-forgotten dungeons. Adventure waits on every street corner, behind every locked door, and below every cellar! 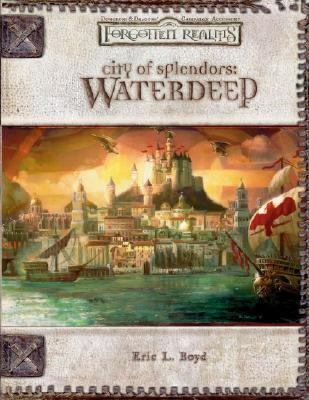 This supplement for the D and DR game offers an in-depth examination of Waterdeep. It includes a rich history of the city, detailed city maps, descriptions of key locations, statistics for important NPCs, information on local laws, and rules for running and playing in Waterdhavian adventures. * 4 prestige classes * 38 magic items * 11 city maps.Boyd, Eric L. is the author of 'City Of Splendors Waterdeep', published 2005 under ISBN 9780786936939 and ISBN 0786936932. Loading marketplace prices 7 copies from $98.25 How does the rental process work?